Leh(Ladakh) July 9, (Scoop News)-The Congress Policy Planning Group (CPPG), after wrapping up Kargil tour visited Leh on Monday where they met cross sections of people, including political and social groups to get to know their views on the socio-political scenario obtaining in Ladakh region. The deputations who called on CPPG briefed it about the social and political developments obtaining in Leh district. Many important issues of public importance also came under discussion, the deputations also discussed various issues with the CPPG, particularly the issues pertaining to overall development of the region and people as well. The group headed by former Union Home Minister P. Chidambaram comprised of former chief minister and leader of opposition (LoP) in Rajya Sabham Gulam Nabi Azad, state Congress chief G.A. Mir, CLP leader Nawang Rigzin Jora and former MP Tariq Hamid Qarra and DCC president, Tsering Samphel, held detailed discussion with regard to overall development and other issues benefiting people at grass roots level. 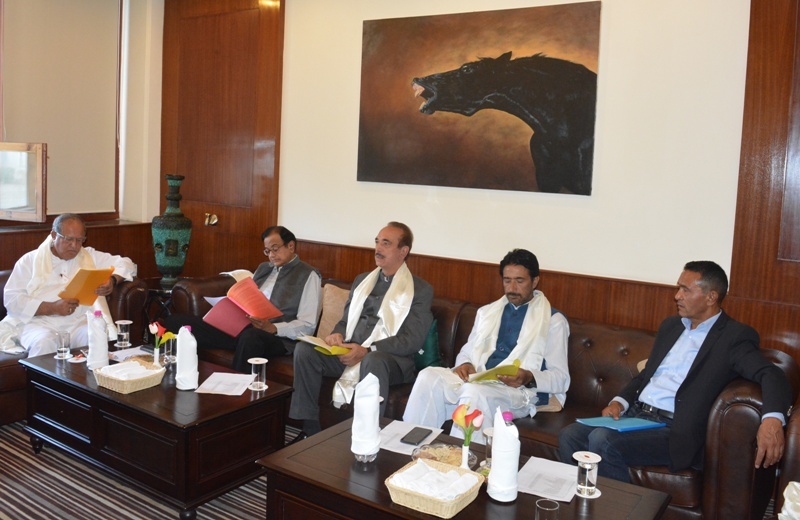 The deputations who called on CPPG included Anjuman Islam Leh, Ladakh Buddhist Association, Anjuman Imamia Leh, All Ladakh Gonpa Association, Anjuman Moin-Ul-Islam Leh, Christian Community, District Congress Committee Leh, Ex Serviceman League, War Widows, Gallantry Awardees, Women’s of District Leh, Ex. Panchayats Representatives, All Ladakh Travel and Trade Association, Press Club of Leh, Merchants Association, Ladakh Students Union, Ladakh Coop Transport, Society, Himalayan Buddhist Cultural Association, Congress Councilors and Ex. Councilors of LAHDC, Ladakh Bus Coop. Ltd, Changthang Nomadic, Bar Association Leh, Namberdars Association, Sham Association, Nubra Delegation, Anjuman Sofiya Nurbaksh, All NGO Alliance and others.